Commuters will love living here because of the location.Briarwood Freehold, condos for sale. Briarwood is a condominium community in Freehold Township, Monmouth County, NJ. 96 homes were built in Briarwood Freehold in 1984. There are 12 buildings with 8 condos in each building, 4 upper units and 4 lower units, all end units, each with 1308 sq ft*. In fact, each unit has the same floor plan, with 2 bedrooms. 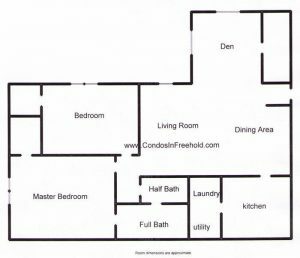 Further, each has a large walk-in closet, a kitchen, utility/laundry room, living room/dining room, a sunroom with an open floor plan. There is a large storage closet in the sunroom as well, and in some units a wall has been added for privacy, or to create a third bedroom or den. Each home also has 1.5 baths. The monthly fee includes common area maintenance, lawn care, snow removal, garbage removal. However, pets are not allowed in Briarwood. Because FHA financing is not approved in Briarwood, purchasing a home with an FHA loan is not possible. However – there are other programs for qualified borrowers that do allow for low cash down payments. Please call 732-598-7700 for more info. Commuters will love living here because of the location. Located near Route 9, Route 18 and Route 537, Briarwood offers easy access to transportation, as well as the exciting downtown of Freehold. Also, a Park and Ride lot is located on Route 9 for bus service along Route 9 and to New York. School age children living here will attend the Freehold Township school system. Kindergarten through fifth grade students will attend JJ Catena School. Children in grades six through eight will go to Eisenhower School. High school students will attend the Freehold Regional High School system. In addition, students may elect to attend the specialized courses in one of the six high schools in the Freehold Regional High School District.